Journal of the House of Lords: Volume 6, 1643. Originally published by His Majesty's Stationery Office, London, 1767-1830. DIE Martis, videlicet, 25 die Julii. Lieutenant Johnson reprimanded, for insulting the E. of Holland at the Court of Guard at Hyde Park Corner. French Ambassador and his Retinue, a Pass to go Home. and with a Letter about the Rising in Kent. Ellicott to attend about Tench's Cause. Ordinance for raising Forces in Surrey. Message to the H. C. that the Lords agree to it. Wright, for printing an Ordinance by Order of this House, attached by the H. C.
Reparation to be desired of the H. C. by his immediate Releasement. Message to them, for that Purpose. Message from thence, for a Conference about it. Letters to be sent to Holland. Report of the Conference about Wright. Printer to this House, being attached by the H. C.
Order for Sir David Watkins's Indemnity, for paying Part of the Fine for the Wardship of Robert Smith, according to the Order of both Houses. Letter from both Houses to The States of Holland, concerning Supplies for Ireland. Letters to Mr. Strickland, & al. to further this Service. 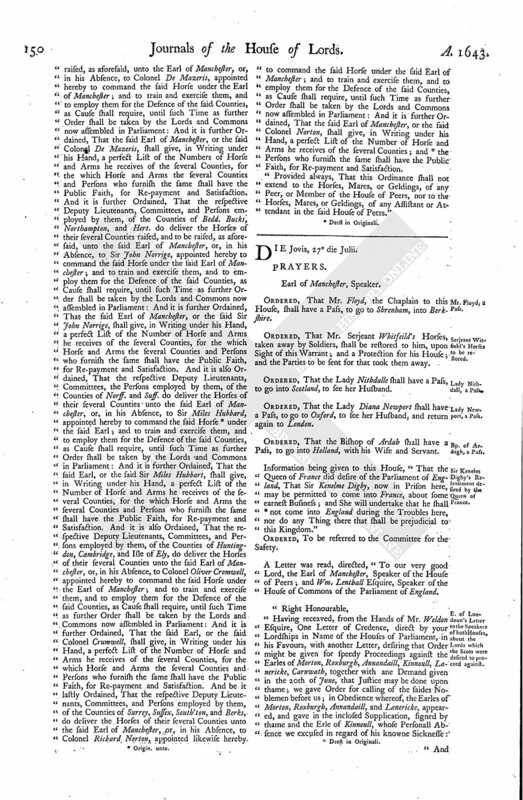 Ordinance for raising Horse in several Counties, and for the E. of Manchester to command there in Chief. Ordered, That the Cause between Forrest and Phillips shall be heard at this Bar peremptorily on the 20th of October next. Next, the Lieutenant, John Johnson, that misbehaved himself toward the Earl of Holland and his Lady at Hide Parke Corner, at the Court of Guard: Hereupon the House Resolved, To commit him but, at the Request and Desire of the Earl of Holland to this House, that he might not be imprisoned, which at his Lordship's Entreaty the House did not commit; but he was called in, and told, "That the House, for this Offence, was Resolved to commit him; but, at his Lordship's Request, their Lordships remitted it; but with this Caution, that he should better behave himself with more Respect to the Peers hereafter; which if he doth not, their Lordships will punish him for this Offence and that too." Ordered, That the French Ambassador shall have a Pass, to go into France, with such Company as he shall deliver in the Names of, and to have Liberty to transport Twelve Horses; and his Servants, with his Bag and Baggage, shall be permitted to embark themselves at Rye. 2. To desire Expedition in the Ordinance formerly brought up, for ordering the keeping of the Communicating Line about this City. 3. To desire Expedition in the Ordinance concerning Newcastle. 4. To present to their Lordships a Letter, containing an Account of the Business in Kent. That this House will take these Ordinances into Consideration, and return an Answer by Messengers of their own. Ordered, That Mr. Hugh Maye, the King's Page, shall have a Pass, to go (fn. 1) to attend upon His Majesty. Ordered, That Mrs. Webb shall have a Pass, to go to Oxford. Ordered, That Ellicott shall appear before this House on Thursday Morning next, about the Business of Christopher Tench and others. Ordered, That Mrs. Murrey shall have a Pass, to go to Oxford, and return again to London. E. Denbigh. L. Viscount Say & Seale. "In the Second Line, after the Word ["by"], put out all till the Word ["and"]. "In the Third Line, instead thereof, put in those Words ["Forces raised against Authority of Parliament"]." The House taking these into Consideration; it was Resolved, upon the Question, That this House agrees to this Ordinance, with these Alterations. To let them know, that this House agrees to the Ordinance for securing Surry, with these Alterations. The Petition of John Wright was read; shewing, That he, being constantly employed for printing such Things as by the Directions from this House he is commanded, and having lately received the Ordinance for the Excise, to be printed, with an Order under the Clerk of the Parliament's Hand for doing the same; he hath been attached, by virtue of an Order of the House of Commons, and is now in Custody of the Messenger of the House of Commons, as a Delinquent, for so doing." Hereupon the House Ordered, To send a Message to the House of Commons, to let them know, that this House hath been informed, by Petition from the Printer that belongs to this House, who is a necessary Servant, and continually ready to perform the Commands of this House, "That he is attached, and is now in Custody of a Messenger of the House of Commons, for printing the Ordinance for the Excise, though he hath an Order of this House for doing the same;" their Lordships holding it to be an unquestionable Right, that all Things that are agreed upon last in this House are to be printed by Order of this House: Which said Commitment of their Servant their Lordships hold to be a great Breach of the Privilege of this House; and therefore, by Way of Reparation, their Lordships do desire he may be presently enlarged, whereby he may attend the Service of this House. A Message to this Purpose was sent to the House of Commons, by Mr. Serjeant Whitfeild and Mr. Serjeant Fynch. That the House of Commons will presently send an Answer, by Messengers of their own. A Message was brought from the House of Commons, by Sir Rob't Parkburst Knight, &c.
To desire a present Conference, if it may stand with their Lordships Conveniency, touching the late Message concerning the Ordinance touching the Excise. Ordered, That the Lord Gray of Warke shall be presently released of his Imprisonment in The Tower of London. This Letter is touching Ireland. 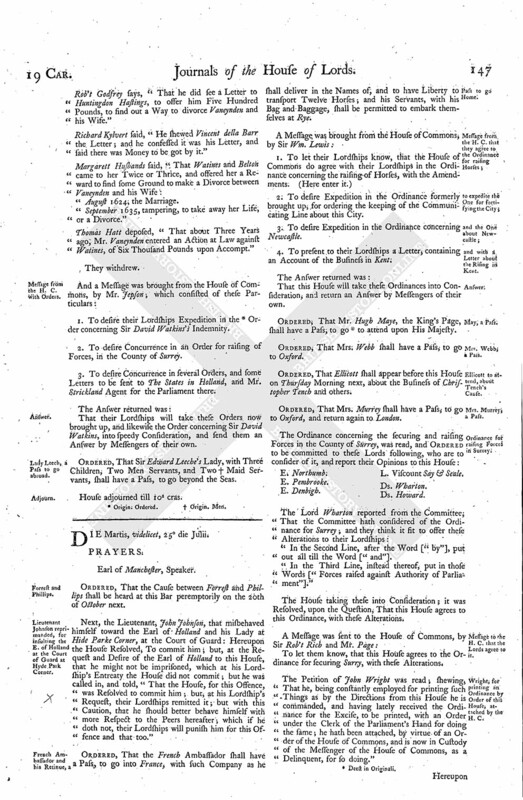 And the Speaker reported the Effect of this Conference; which was, "To let their Lordships know, that John Wright, the Printer, was not sent for by the House of Commons as a Delinquent for printing the Ordinance for the Excise, according to their Lordships Order; but because he entered it in the Book at Stationers Hall as printed by the Lords and Commons, when he had no Order from the House of Commons; and besides, they are informed he spake some unbeseeming Words." "Whereas, in Obedience to an Order and Command of the House of Commons in Parliament, of the 22d of April last, Sir David Watkins Knight, and Henry Clarke Serjeant at Law, did pay unto the Treasurers of The Guildhall, London, appointed by an Ordinance of both Houses of Parliament, for the Propositions of Money, Plate, and Horses made the 10th of July, 1642, the Sum of Four Hundred Pounds, which they had in their Hands, to be paid into the Court of Wards, in Part of the Fine for the Wardship of the Body of Robert Smith Esquire, Son and Heir of Sir John Smith Knight, deceased, upon Composition made by the Master and Council of the Court of Wards; and Two Hundred and Fifty Pounds, due at or upon the 25th Day of March, 1643, which was to be paid into the said Court of Wards, for Rent of the Lands of the said Ward: The Lords and Commons do Declare and Ordain, That the said Sir David Watkins, Serjeant Clarke, and Robert Smith the Ward, shall be secured and saved harmless, by both Houses of Parliament; and they and every of them are hereby discharged, for Time to come, against the King, and all Persons whatsoever, from Payment of the said Sums, and every Part thereof." This same Letter, sent to Mr. Strickland, to be sent to Mr. Adam Lawrence and Mr. Derickhost. "A Declaration and Ordinance of the Lords and Commons in Parliament, for raising a Body of Horse. 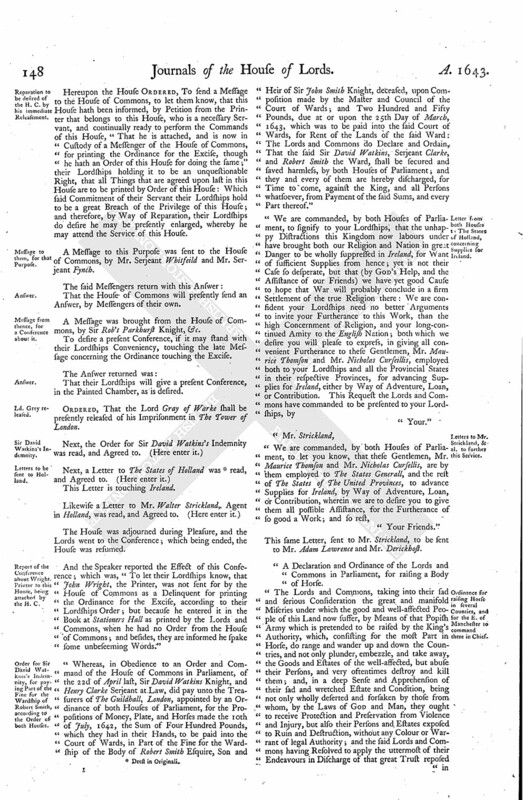 "The Lords and Commons, taking into their sad and serious Consideration the great and manifold Miseries under which the good and well-affected People of this Land now suffer, by Means of that Popish Army which is pretended to be raised by the King's Authority, which, consisting for the most Part in Horse, do range and wander up and down the Countries, and not only plunder, embezzle, and take away, the Goods and Estates of the well-affected, but abuse their Persons, and very oftentimes destroy and kill them; and, in a deep Sense and Apprehension of their sad and wretched Estate and Condition, being not only wholly deserted and forsaken by those from whom, by the Laws of God and Man, they ought to receive Protection and Preservation from Violence and Injury, but also their Persons and Estates exposed to Ruin and Destruction, without any Colour or Warrant of legal Authority; and the said Lords and Commons having Resolved to apply the uttermost of their Endeavours in Discharge of that great Trust reposed in them, for the Preservation, Peace, and Safety of the People of this Kingdom, and securing their Persons and Estates from the Rapine and Fury of the Soldiers; and finding it most necessary that a Body of Horse should be forthwith raised, to resist and repel the Insolencies and Outrages committed by the Soldiers of the King's Army; not doubting but all good People will readily and willingly contribute their best Assistance unto a Work so necessary for the Good of the Kingdom, and their own Preservation, have thought fit, and do hereby Declare and Ordain, That such Number of good, able, and sufficient Horses for Service (of which the Troops of Trained Horse of each County are to be accounted as Part) shall be forthwith raised, in such Counties, Cities, and Places, and brought unto such Places of Rendezvous, and at such Times, as are hereafter in this Ordinance mentioned and expressed; that is to say, within the Cities of London and Westm. and Suburbs thereof, and the County of Midd. there shall be forthwith raised Fifteen Hundred Horse; within the County of Hert. 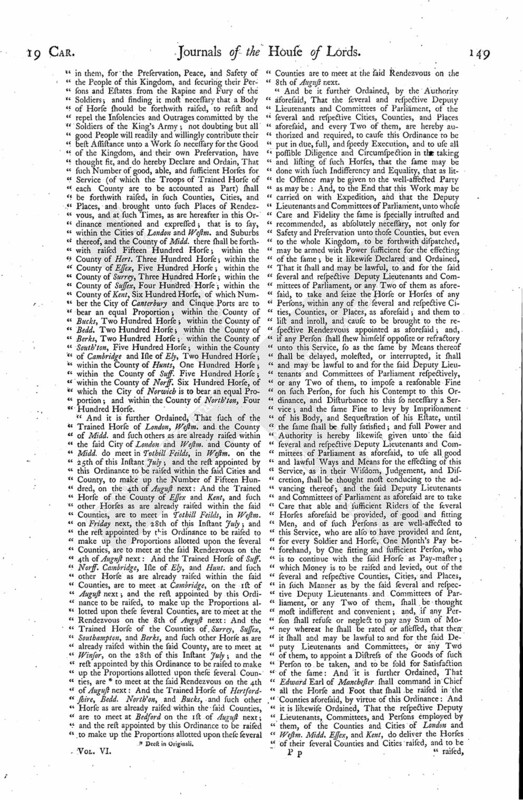 Three Hundred Horse; within the County of Essex, Five Hundred Horse; within the County of Surrey, Three Hundred Horse; within the County of Sussex, Four Hundred Horse; within the County of Kent, Six Hundred Horse, of which Number the City of Canterbury and Cinque Ports are to bear an equal Proportion; within the County of Bucks, Two Hundred Horse; within the County of Bedd. Two Hundred Horse; within the County of Berks, Two Hundred Horse; within the County of South'ton, Five Hundred Horse; within the County of Cambridge and Isle of Ely, Two Hundred Horse; within the County of Hunts, One Hundred Horse; within the County of Suff. Five Hundred Horse; within the County of Norff. Six Hundred Horse, of which the City of Norwich is to bear an equal Proportion; and within the County of North'ton, Four Hundred Horse. "And it is further Ordained, That such of the Trained Horse of London, Westm. and the County of Midd. and such others as are already raised within the said City of London and Westm. and County of Midd. do meet in Tothill Feilds, in Westm. on the 25th of this Instant July; and the rest appointed by this Ordinance to be raised within the said Cities and County, to make up the Number of Fifteen Hundred, on the 4th of August next: And the Trained Horse of the County of Essex and Kent, and such other Horses as are already raised within the said Counties, are to meet in Totbill Feilds, in Westm. on Friday next, the 28th of this Instant July; and the rest appointed by this Ordinance to be raised to make up the Proportions allotted upon the several Counties, are to meet at the said Rendezvous on the 4th of Augnst next: And the Trained Horse of Suff. Norff. Cambridge, Isle of Ely, and Hunt. and such other Horse as are already raised within the said Counties, are to meet at Cambridge, on the 1st of August next; and the rest appointed by this Ordinance to be raised, to make up the Proportions allotted upon these several Counties, are to meet at the Rendezvous on the 8th of August next: And the Trained Horse of the Counties of Surrey, Sussex, Southampton, and Berks, and such other Horse as are already raised within the said County, are to meet at Winsor, on the 28th of this Instant July; and the rest appointed by this Ordinance to be raised to make up the Proportions allotted upon these several Counties, are (fn. 3) to meet at the said Rendezvous on the 4th of August next: And the Trained Horse of Hertfordshire, Bedd. North'on, and Bucks, and such other Horse as are already raised within the said Counties, are to meet at Bedford on the 1st of August next; and the rest appointed by this Ordinance to be raised to make up the Proportions allotted upon these several Counties are to meet at the said Rendezvous on the 8th of August next. "And be it further Ordained, by the Authority aforesaid, That the several and respective Deputy Lieutenants and Committees of Parliament, of the several and respective Cities, Counties, and Places aforesaid, and every Two of them, are hereby authorized and required, to cause this Ordinance to be put in due, full, and speedy Execution, and to use all possible Diligence and Circumspection in the taking and listing of such Horses, that the same may be done with such Indifferency and Equality, that as little Offence may be given to the well-affected Party as may be: And, to the End that this Work may be carried on with Expedition, and that the Deputy Lieutenants and Committees of Parliament, unto whose Care and Fidelity the same is specially intrusted and recommended, as absolutely necessary, not only for Safety and Preservation unto those Counties, but even to the whole Kingdom, to be forthwith dispatched, may be armed with Power sufficient for the effecting of the same; be it likewise Declared and Ordained, That it shall and may be lawful, to and for the said several and respective Deputy Lieutenants and Committees of Parliament, or any Two of them as aforesaid, to take and seize the Horse or Horses of any Persons, within any of the several and respective Cities, Counties, or Places, as aforesaid; and them to list and inroll, and cause to be brought to the respective Rendezvous appointed as aforesaid; and, if any Person shall shew himself opposite or refractory unto this Service, so as the same by Means thereof shall be delayed, molested, or interrupted, it shall and may be lawful to and for the said Deputy Lieutenants and Committees of Parliament respectively, or any Two of them, to impose a reasonable Fine on such Person, for such his Contempt to this Ordinance, and Disturbance to this so necessary a Service; and the same Fine to levy by Imprisonment of his Body, and Sequestration of his Estate, until the same shall be fully satisfied; and full Power and Authority is hereby likewise given unto the said several and respective Deputy Lieutenants and Committees of Parliament as aforesaid, to use all good and lawful Ways and Means for the effecting of this Service, as in their Wisdom, Judgement, and Discretion, shall be thought most conducing to the advancing thereof; and the said Deputy Lieutenants and Committees of Parliament as aforesaid are to take Care that able and sufficient Riders of the several Horses aforesaid be provided, of good and fitting Men, and of such Persons as are well-affected to this Service, who are also to have provided and sent, for every Soldier and Horse, One Month's Pay beforehand, by One fitting and sufficient Person, who is to continue with the said Horse as Pay-master; which Money is to be raised and levied, out of the several and respective Counties, Cities, and Places, in such Manner as by the said several and respective Deputy Lieutenants and Committees of Parliament, or any Two of them, shall be thought most indifferent and convenient; and, if any Person shall refuse or neglect to pay any Sum of Money whereat he shall be rated or assessed, that then it shall and may be lawful to and for the said Deputy Lieutenants and Committees, or any Two of them, to appoint a Distress of the Goods of such Person to be taken, and to be sold for Satisfaction of the same: And it is further Ordained, That Edward Earl of Manchester shall command in Chief all the Horse and Foot that shall be raised in the Counties aforesaid, by virtue of this Ordinance: And it is likewise Ordained, That the respective Deputy Lieutenants, Committees, and Persons employed by them, of the Counties and Cities of London and Westm. Midd. Essex, and Kent, do deliver the Horses of their several Counties and Cities raised, and to be raised, as aforesaid, unto the Earl of Manchester, or, in his Absence, to Colonel De Mazeris, appointed hereby to command the said Horse under the Earl of Manchester; and to train and exercise them, and to employ them for the Defence of the said Counties, as Cause shall require, until such Time as further Order shall be taken by the Lords and Commons now assembled in Parliament: And it is further Ordained, That the said Earl of Manchester, or the said Colonel De Mazeris, shall give, in Writing under his Hand, a perfect List of the Numbers of Horse and Arms he receives of the several Counties, for the which Horse and Arms the several Counties and Persons who furnish the same shall have the Public Faith, for Re-payment and Satisfaction. And it is further Ordained, That the respective Deputy Lieutenants, Committees, and Persons employed by them, of the Counties of Bedd. Bucks, Northampton, and Hert. do deliver the Horses of their several Counties raised, and to be raised, as aforesaid, unto the said Earl of Manchester, or, in his Absence, to Sir John Norrige, appointed hereby to command the said Horse under the said Earl of Manchester; and to train and exercise them, and to employ them for the Defence of the said Counties, as Cause shall require, until such Time as further Order shall be taken by the Lords and Commons now assembled in Parliament: And it is further Ordained, That the said Earl of Manchester, or the said Sir John Norrige, shall give, in Writing under his Hand, a perfect List of the Number of Horse and Arms he receives of the several Counties, for the which Horse and Arms the several Counties and Persons who furnish the same shall have the Public Faith, for Re-payment and Satisfaction. And it is also Ordained, That the respective Deputy Lieutenants, Committees, the Persons employed by them, of the Counties of Norff. and Suff. do deliver the Horses of their several Counties unto the said Earl of Manchester, or, in his Absence, to Sir Miles Hubbard, appointed hereby to command the said Horse (fn. 4) under the said Earl; and to train and exercise them, and to employ them for the Defence of the said Counties, as Cause shall require, until such Time as further Order shall be taken by the Lords and Commons in Parliament: And it is further Ordained, That the said Earl, or the said Sir Miles Hubbart, shall give, in Writing under his Hand, a perfect List of the Number of Horse and Arms he receives of the several Counties, for the which Horse and Arms the several Counties and Persons who furnish the same shall have the Public Faith, for Re-payment and Satisfaction. And it is also Ordained, That the respective Deputy Lieutenants, Committees, and Persons employed by them, of the Counties of Huntingdon, Cambridge, and Isle of Ely, do deliver the Horses of their several Counties unto the said Earl of Manchester, or, in his Absence, to Colonel Oliver Cromwell, appointed hereby to command the said Horse under the Earl of Manchester; and to train and exercise them, and to employ them for the Defence of the said Counties, as Cause shall require, until such Time as further Order shall be taken by the Lords and Commons now assembled in Parliament: And it is further Ordained, That the said Earl, or the said Colonel Crumwell, shall give, in Writing under his Hand, a perfect List of the Number of Horse and Arms he receives of the several Counties, for the which Horse and Arms the several Counties and Persons who furnish the same shall have the Public Faith, for Re-payment and Satisfaction. And be it lastly Ordained, That the respective Deputy Lieutenants, Committees, and Persons employed by them, of the Counties of Surrey, Sussex, South'ton, and Berks, do deliver the Horses of their several Counties unto the said Earl of Manchester, or, in his Absence, to Colonel Richard Norton, appointed likewise hereby to command the said Horse under the said Earl of Manchester; and to train and exercise them, and to employ them for the Defence of the said Counties, as Cause shall require, until such Time as further Order shall be taken by the Lords and Commons now assembled in Parliament: And it is further Ordained, That the said Earl of Manchester, or the said Colonel Norton, shall give, in Writing under his Hand, a perfect List of the Number of Horse and Arms he receives of the several Counties; and (fn. 5) the Persons who furnish the same shall have the Public Faith, for Re-payment and Satisfaction. "Provided always, That this Ordinance shall not extend to the Horses, Mares, or Geldings, of any Peer, or Member of the House of Peers, nor to the Horses, Mares, or Geldings, of any Assistant or Attendant in the said House of Peers."